Launchpad couldn't import bug #24329 from freedesktop.org Bugzilla. When running on battery, the mouse over text for the battery icon (when running on battery) permanently says "Battery life (estimating...)". An estimate never shows up. See also bug #629257 (one lower) for previous (lukewarm) discussions on the implications of showing "(estimating...)" via the user interface. This two bugs might want re-splitting/sorting again based on those that relate to the chrono estimate not being known, and those that relate to the pointless display of that unknown data for long periods of time to the user. »The new battery menu (which you should have if you are running Ubuntu Lucid or later) does not have tooltips / mouse over text anymore. 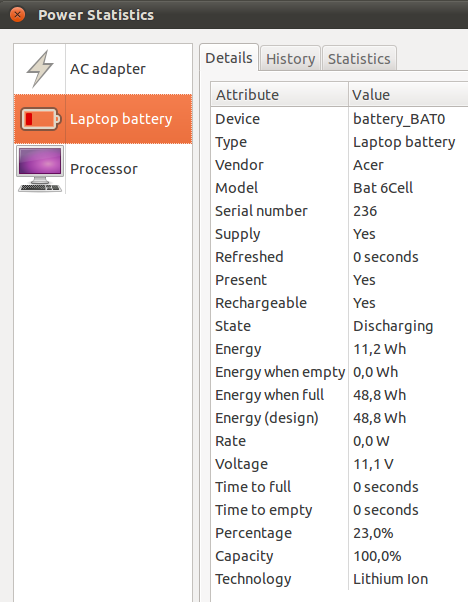 Instead it has a menu item directly showing »Laptop battery X hours X minutes left«. Does it mean nothing that it is apparently already associated with gnome power manager? I have exact same problem. Time didn't estimated in lucid, but at least i had battery charge percentage. Now I totally confused about remaining battery charge. There is no mouseover in Maverick beta for this, however the "menu" item when clicking on the battery effectively remains at "estimating...". The battery icon, however, seems to be visually accurate, showing a battery that empties overtime. This is on an updated 10.10 beta i386 install. FWIW, I can't reproduce this on g-p-m 2.31.92-0ubuntu1 or 2.32.0-0ubuntu1. I have the same problem on a Compaq Presario CQ60-307EA (Laptop). Running Ubuntu 10.10 BETA with latest packages. A lot of HP & Compaq's seem to be affected by this bug. Just upgraded my HP G62-144DX to 10.10 today, and am having the same problem. It seems that most of our computers are unable to estimate time. I don't mind this, I can do my own estimations just fine, but the developers seem to think our computers can do this calculation therefore defaulting it. I've now noticed that when the power is removed a notification is displayed with an accurate % value (but still no tim estimate). I'd ask anyone adding comments here to mention their affected system(s), please don't add "me too"-only comments. applied all updates, removed charger and still estimating, no percentage or time. Just ran apport-collect for my system, where I do get the estimation to show up. Just submitted my apport-collect info from another HP system. I will open a new bug for a mini 9 system I have which is also affected. I've filed bug #654761 about this issue on the Dell Mini 9. This seems a little crazy, my Tosh NB200 battery estimation worked fine until an upgrade, can't remember now if it was 9.10 to 10.04 or 10.04 to 10.10. Anyway, the on screen pop-ups with the % remaining are fine, it's just the panel monitor that doesn't display a time. I installed batmon today as a test, it's graphically very poor, but at least it reports a percentage, it too cannot report an estimated time. Can an option for percentage or time be added to the indicator applet until this is resolved? I think what Milan is saying, is the proper way to say "me too" is to select "Affects Me" at the top of the bug, which will help to give developers an accurate scope of impact _ though this one is pretty high already. I posted upstream (freedesktop-bugs link at the top) where IMHO the bug needs a new title and some more activity. I noted the last dev comment was to look at turning on the time estimation code in October 2009 .. I'm guessing that presented a challenge. I'm having the same issue. 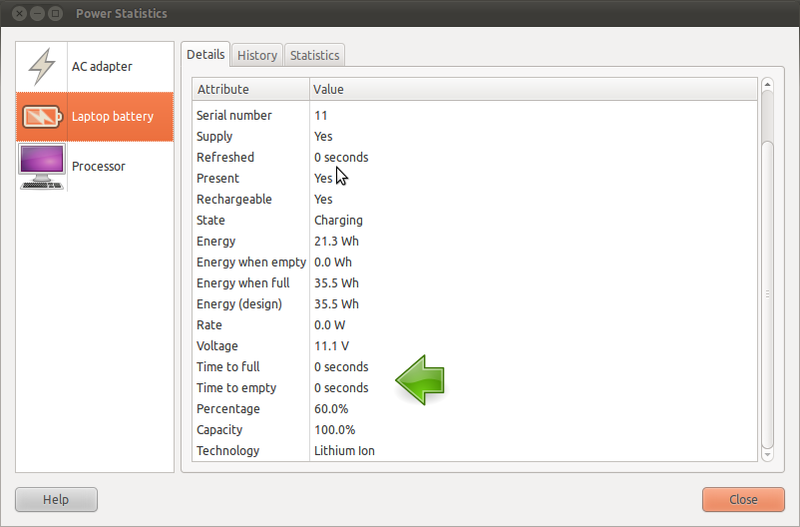 Today I found at http://www.omgubuntu.co.uk/2011/02/battery-applet-status-ubuntu/ an applet which can estimate the battery percentage. > applet which can estimate the battery percentage. > of a duplicate bug (758441). > estimate never shows up. This bug is still prevalent in System76 netbooks with Ubuntu 11.04 installed. This bug is still present in Natty. Sorry, I can't get LauchPad to add natty/upower as a new target for this bug - maybe somebody more au fait with launchpad can do that. I have, however, examined & tested my earlier patch (for upower on 10.10) against upower-0.9.9 that ships with Natty, and it checks out and works fine. Hence, I attach a .deb with the i386 binary of my patched upower, plus the source. If somebody wants to also compile for amd64 architecture and add to their PPA (like they did with the earlier patch) to aid distribution, then I'd be thankful - I don't have time for this. I also see a lot of comments about upstream patches and the need to re-enable the disabled code - this patch does exactly that - fixes the broken estimation code and re-enables it. I don't have time to do it myself, but if somebody wants to commit my patch back up to the ubuntu upower project, then this bug would be fixed for everybody. Can you attach a real patch file or debdiff? Thanks Andy ! I applied you patch and it's work. Just a little bug. The informations are shown twice (see the attachment / capture). Any idea ? I too saw the double reporting of battery status, when I first installed 11.04. However, I saw it *before* I'd installed the patched upower, so I don't think it's related to that (unless you tell me that you only had one line *until* you installed the patch). The thing is, the patch affects upower and the data that it reports -- but the icon belongs to gnome-power-manager, which reads the upower data and draws the graphs and things -- and is nothing to do with upower per se. Unless you can definitely identify the behaviour as coming from the patched upower, I'd be tempted to file a new bug under gnome-power-manager. If it's any help, the double reporting seemed to go away for me as soon as I installed all the latest package updates, though as I said, that was before I'd installed the upower patch. The double reporting of battery status was already present before that. maybe we could just merge that as a replacement? > The double reporting of battery status was already present before that. > duplicate bug report (758441). I pointed the upstream maintainer to Andy's patch, and he just committed something slightly improved. - Fix estimation rate for batteries that do not provide this data. * debian/watch: Look for *.xz tarballs, upstream only publishes these now. Repack our tarball as tar.bz2. If someone provides a debdiff for natty and adds the required information for a SRU, I am happy to sponsor that. Rebuilding the 0.9.12-1 sources on Natty and installing it not only doesn't fix the problem, but makes my laptop suspend any time it is unplugged. I don't understand all the null updates. My laptop HP DV6646US worked perfectly on the previous 2 releases of Ubuntu. It worked correctly on Natty initially using the classic desktop. But after about a month it stopped working and only shows estimating. I am convinced something changed shortly after Natty was released. Anyhow I think my computer battery must pass the correct information or it would not have worked on the previous releases. And it appears hundred of other users must agree with me. I'm on Precise right now, with upower 0.9.15 and the problem appears to be solved. I'm on saucy 13.10, and the problem seems to still be present! I have this problem on Ubuntu 16.04 running on my Acer Aspire ES 17. I have it on 16.04 LTS running on a Fujitsu LifeBook T4215. There is an "estimating" message, and the percentage rises from 50% to 100%, then cycles in the same range. The laptop is a dual boot with Windows 10, and Windows is also showing the same, "estimating and cycling" behavior. I've read in other threads that it is a potential BIOS update issue. IJS. This bug was fixed over six years ago. If you experience similar systems on multiple operating systems, contact your PC vendor. Otherwise, report a separate bug. Displaying first 40 and last 40 comments. View all 187 comments or add a comment.